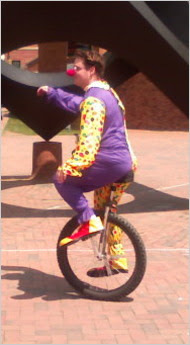 Home » cellphones , clowns , humor , psychology » Would YOU notice a clown on a unicycle? Would YOU notice a clown on a unicycle? "I was trying to think about what kind of distraction we could put out there, and I talked to this student who had a unicycle," said Ira E. Hyman Jr., a professor in the university's psychology department. "He said, 'What's more, I own a clown suit.' You don’t have a student who unicycles in a clown suit every day, so you have to take advantage of these things." The result is a fascinating study that suggests pedestrians who talk on cellphones are oblivious to the events around them. In two studies, Dr. Hyman and his students monitored pedestrian traffic across a popular campus square. They tracked a total of 347 pedestrians, noting whether they were walking without distraction, listening to music, talking with a friend or talking on the phone. In the first study, they noticed that people talking on the cellphone walked more slowly, changed directions more frequently and were often weaving off course. They were also less likely to acknowledge other people with a head nod or a wave. Now, enter the unicycling clown. The student, Dustin Randall, donned a purple-and-yellow clown costume with polka dot sleeves, red shoes and bulbous red nose. And then Mr. Randall hopped on a unicycle and began pedaling around the square for an hour. After pedestrians crossed the square, the researchers stopped the walkers and asked, "Did you see anything unusual?" Among pedestrians who were listening to music or walking alone, one in three mentioned that they had just seen a clown on a unicycle. Nearly 60 percent of people who were walking with a friend mentioned the clown. But among people who had been talking on the cellphone, only 8 percent spontaneously remembered the clown. Then the researchers followed up with a second question: "Did you see the unicycling clown?" With prompting, 71 percent of the people walking with a friend remembered the clown. The numbers were also higher for people listening to music (61 percent) and those who were walking alone (51 percent). "It's a huge dropoff of awareness of the environment around them," Dr. Hyman said. "It shows that even during as simple a task as walking, performance drops off when talking on the cellphone. They're slower, less aware of their surroundings and weaving around more. It shows how much worse it would be if they were driving a car, which is a more complex task to manage."